Basically, anything that is marked "Complete and balanced" is supposed to fulfill the requirements for any dog, and most dogs will eat just about anything with great abandon. However, I am usually a bit more concerned about the food that I feed my dogs (as are many dog owners). There is such a wide variety of dog foods on the market, and a new, upscale "boutique" class of foods showing up every day that it can get pretty confusing. Also remember that puppies and adult dogs need different kinds of food. It is usually recommended that you feed puppies a balanced puppy formula food for their first year - however, with many large breeds, this can lead to growth that is too fast and may cause bone, joint, and tendon problems. With large breeds (like Akitas, St. Bernards, Shepherds, etc. 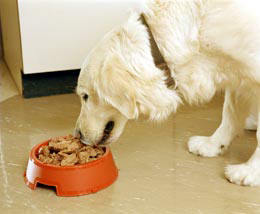 ), vets normally recommend that you switch to a good quality adult food at 4-6 months. Some breeders advocate feeding giant breed puppies only adult food to control their growth. There is some concern, too, about soy products in dog food. Many premium foods have switched from a soy-based formula because of tentative links to bloat and thyroid problems in some dogs. Akitas are quite sensitive to this, and as a result, we avoid any food with soy products in it. Geriatric -- usually an easier to digest formula, such as lamb and rice, or chicken and rice. Prescription Diets -- hypoallergenic, or post-surgery diets. Commercial foods also come in several forms. Dry food -- such as Iams, Dog Chow, Diamond, etc. These usually come in a variety of formulas for puppies, adult dogs, or active dogs. This is the most convenient way to free-feed dogs, since the food does not easily spoil. It can be "dressed up" with the addition of water to soften the food, broth, additional canned food, etc. Apparently, it is even possible to feed a dog entirely on dog biscuits , although I can't possibly imagine it's healthy. Dry dog food comes in a variety of ingredients, as well - chicken based, beef based, lamb, lamb and rice, corn, turkey and barley, and in at least one case, fish based. Most have meat by-products (the non-human edible parts) and the better ones have meat-meal. Still, much of the bulk of these foods is grain-based. Dry food also comes in a variety of shapes, from small chunks, or pellets, to little bone shapes. Why the dog really cares is beyond me, but some research has shown that dogs do respond to "mouth feel" in much the same way we do (ever wonder why you like real ice cream?). The size of the pieces does seem to make a difference, though. You wouldn't want to feed a toy breed big kibble bits, and watching a St. Bernard eat tiny little morsels of dry food is really rather amusing. Both of our dogs had a hard time with Purina Pro Plan, which is in small disk shapes they tended to just swallow whole, and prefer the larger bites of Iams food. Your dog may not even notice. A comparison listing of commercial dry dog foods can illustrate the differences in formulas and ingredients. Soft/Moist food -- these are usually packaged in pillow-pouches or burger-shapes. Also, there are a number of foods that combine dry food and soft food (i.e. Kibbles and Bits). These are often higher in artificial colors and flavors than dry or canned foods, and can be extremely high in salt. They do store well, however, and are very convenient in the prepackaged form. Some dogs have digestive problems with these foods, including diarrhea and gasp! flatulence. These foods often have added colors, flavors, aromas that seem to appeal more to the human buying the food than the dog eating it. They are quite often pressed into little chop shapes or in strips to resemble marbled steak - a nuance I doubt the dog really appreciates. I will admit to classing these foods in the same category as "dog treats" attempting to mimic sausage or bacon... kind of like the dog equivalent of junk food. Of course, most dogs love this kind of food. I once left Maesc alone with the groceries in the car when I'd picked up a bag of Tender Chops for my Mom's dog and came back to a completely empty bag. He ate 4 lbs of the stuff in the space of a few minutes, and looked very pleased with himself, too. Canned food -- From Alpo to Science Diet. While we humans may be a bit squeamish about the contents of the cans, the dogs seem to love it. This is probably the most expensive way to feed your dog, especially if it is a large breed. Some foods recommend one can per 20lbs of body weight. I'd be feeding six cans of food a day. Most are meat based, or at least "animal tissue" based (which really makes me a bit nervous. ), and are very digestible. I try to avoid at all costs actually examining the stuff in the can, which usually includes innards and organ meat, including hearts and lungs. But, this kind of diet really does provide good nutrition for dogs, who as carnivores would eat entrails from a kill first. (I just recently read that a mouse - fur and all - was probably the most balanced meal for a cat, even if people would shudder at the thought of minced mouse-in-a-can. The same can probably be said for dogs). These foods now come in a variety of formulas as well, from chicken and poultry foods to lamb and rice diets, as well as the standard beef and horsemeat. Some have "gravy", or are meant to resemble stews. Current quality standards on all but the lowest priced canned foods seems to be good, and some of the pricier little cans of "gourmet" food are starting to resemble human food. This seems to reflect a trend in the pet market, as well - health food, dietetic food, low fat food, gourmet food, all natural food. The shelves in the pet stores are beginning to look like the better human grocery stores. The lower priced foods are best avoided, though. Once you figure the cost of marketing, packaging, and shipping to the store, how much good food can be in a can that retails 4/$1.00? Home diets -- homemade "stews" or hand-mixed combinations of other foods can be just as nutritious as a commercial diet and can give you more control over the quality and content of the food. You do need to know about the value of the foods that you are serving. The inclusion of fresh foods in a home diet (including vegetables and fruits) can be beneficial. Of course, it could also give your dog a taste for carrots, so they dig up your entire garden looking for them! Table Scraps -- For generations, dogs were fed on the scraps from the human meal. This is an acceptable means of feeding a dog only if the food that you are feeding the dog would otherwise go into the refrigerator for your consumption, not into the trash. Some dog owners are extremely careful about never feeding their dog "human food", feeling that it can unbalance their diet and put them off their dog food, cause digestive upsets (one word of warning - chili and dogs do not mix well), or encourage bad begging behavior, etc. Others freely feed tidbits from the table. Personally, I share my food with my dogs in small amounts, and only as long as it does not affect their consumption of their own food. We usually put that last smidgen of gravy over their food, or the last of the vegetables or spaghetti sauce mixed in. Do whatever you want. You aren't depriving your dog if you do not feed human food, regardless of the sad and hungry looks, nor are you necessarily hurting them by doing so. Just remember the sense of scale: a slice of cheese is a small snack for a St. Bernard, but probably represents a day's worth of calories for a Pomeranian. Raw Diet -- Many people also feed their dogs a completely raw diet, including fresh meat, veggies, and fruits, and raw bones. Usually the meat is whole chickens or beef, and a wide variety of other fresh foods. THis kind of diet also includes bones -- which tends to freak me out to no end. However, uncooked bones are usually safe, cooking them makes them brittle and prone to splinter. Most people feed some combination of the above foods. For example, I feed dry food mixed with broth (or canned food in the winter). I avoid the semi-moist foods (such as Kibbles and Bits and Tender Chops) since the artificial colors seem to go straight through the dogs and cause all sorts of upsets. My family, however, has always fed the 'burger" food and their dogs are healthy and happy as well. Many others feed canned food, or dry with additional food added - often fish or liver or eggs - for a balanced diet.